Here we are again! 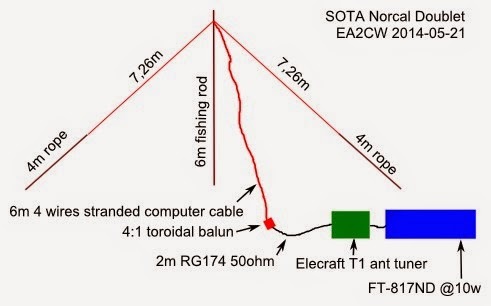 A new SOTA summit for me, and in CW for all as well. 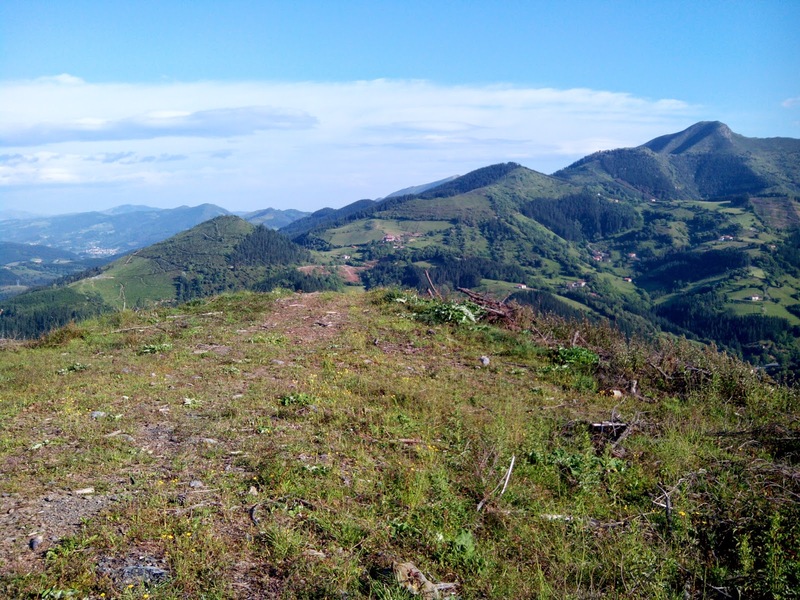 After the "La Vida" EA1/CT-098 early morning experience, having made 2 VK QSO with such a small antenna (just an 1.5 m telescopic one), I wanted to try another early activation, now in better conditions. I chose Luxamendi, near Laudio in Araba, because it is relatively easy, never activated nor HF neither CW, and was a new one for me. Wheather predictions expected rain around 11:00 local (09:00 UT), so it would be a fast one. Despite going by motorcycle -around 54 km from home- I carried a new 6 meter fiber fishing pole, that later I will use as home antenna. It is about 1.45 m length, and not too easy to carry on the bike, but I managed to do it well enough. Also, yesterday evening, I had prepared a new antenna for testing. No comparision could be made with previous activations, as propagation makes always his work introducing unexpected variables. 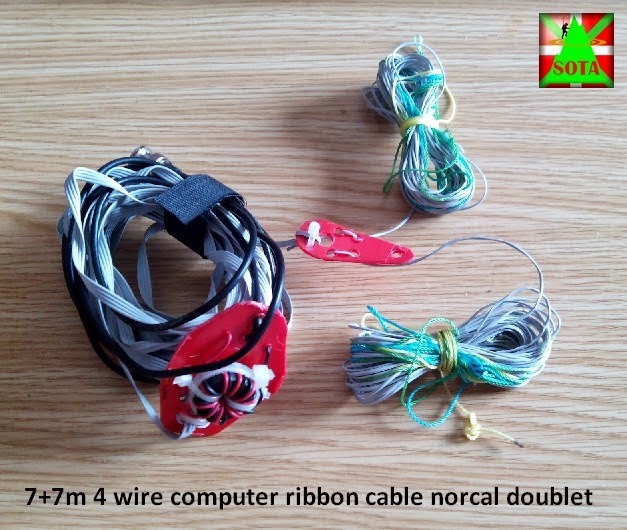 It was the light norcal doublet, made with computer ribbon, as described by KI6DS at http://www.norcalqrp.org/norcaldoublet.htm It cost me no more than two hours to prepare the 4 wires ribbon , the 4:1 balun, and 2 meters RG-174 wire to connect the Elecraft T1 ant. tuner later. At the beginning was no wind, so I could set the antenna up quite easily. Just after tuning it on 14 mhz. (pretty fast with the elecraft, which seemed to be a little surprised by the new norcal) I heard Patricio EA2EX who was activating a near one. Fine signals on both sides! It might be success! A couple of minutes later, 2 S2S QSO's more, this time with Michael GW0HIO and Klaus DF2GN. The signals were not the best, but nice enough to make a total of 7 S2S along the activation. At 07:11 UT came my first dx, with Joao CU3AA from Azores (14 mhz CW) with 599/599 pretty strong signals. Later, at 08:00 UT, I made a new QSO with Gerard VK2IO, 559 sent, 339 received. So the antenna was making its work, at least to jump out of EU with the usual 9-10 watts. Around 08:15 UT, the clouds were appearing from the north, and it was clear that they were carrying rain, which could be easily be seen. So, a handful of SSB QSOs later, and with the wind becoming stronger by minutes, I decided to make a quick retreat. I phoned Patricio who was already under the rain. This put me wings and I ran mountain down (well, ran...) towards the country house, just a 20 min descent, at my average "water-coming" emergency speed. So, a bit wet after arriving, I ended the activation. More tests must be made to the norcal to see if it can replace the old and reliable linked dipole. "La Vida" (Life) EA1/CT-098, an odd activation.